A lot of my time is spent on calls talking to people about Tin Can. Sometimes the person I’m speaking to is just interested in Tin Can generally or wants some advice, and other times they are interested in finding out more about one of our products too; in those cases I often tag team the call with someone from the sales team for the relevant products. A few times after the call, the sales person will thank me for taking all the hard questions, which always surprises me because from my point of view they jumped in to answer the hard questions. I just answered the easy stuff about Tin Can that’s within my area of expertise; they had all the knowledge about our products, costs, and why we’re awesome, and they answered eloquently where I would have stumbled and lacked the facts. We each have our own domain of knowledge, expertise and skills. 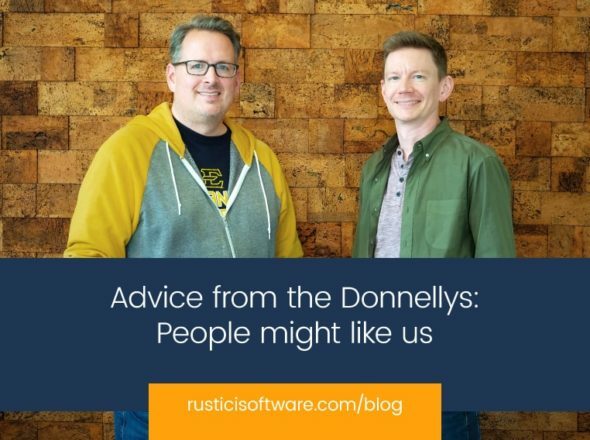 That’s one of the things I love about working at Rustici Software; everybody you work with has expertise in their domain, isn’t afraid to bring it to the table, and values the expertise of those around them. I experienced this again recently when doing some planning work for a refresh of tincanapi.com. Marketing really isn’t my area of expertise, but Jeff Horne has won awards for his marketeering. I bring to the table knowledge of the subject matter and audience for tincanapi.com and I’m responsible for the project, but the gaps in my expertise are filled in by really helpful feedback and comments from Jeff. By working together, we’re building something better than we could have achieved individually; the output of my work is better because of Jeff’s expertise. That’s awesome.